Surprised about Sebastian Vettel’s stunning performance at last Sunday’s British Grand Prix? Be surprised no more: he has signed a hefty pact with the devil. New to the informational deluge of Formula One this season is a table of pre-race car weights published on the official Formula One website. The published weights include car, driver and fuel, helping the erudite and mathematically inclined viewer separate a car’s performance from the hydrocarbons and the sole human sloshing inside. 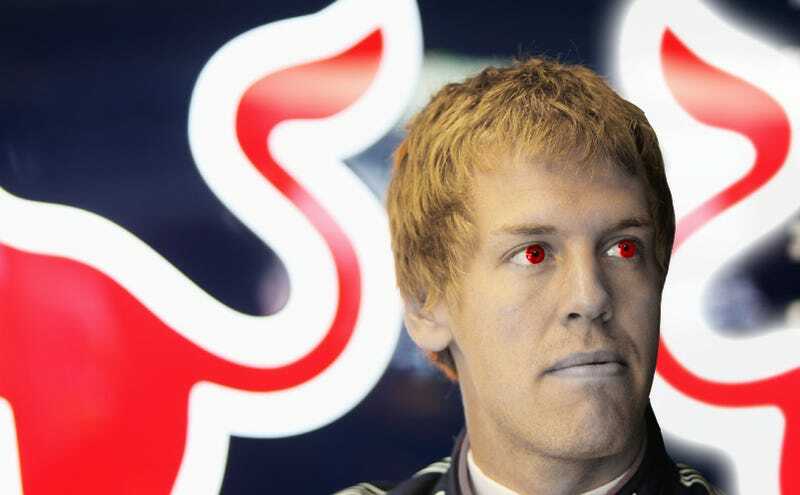 As the combined weight of Sebastian Vettel, his load of fuel and his Red Bull RB5 race car is within rounding error of the Number of the Beast, one cannot help but wonder whether his hat trick of pole position, fastest lap and race win were achieved with netherworldly help. He certainly looked like a man who had borrowed Lucifer’s great leather wings for the last sixty laps of F1 racing Silverstone will witness for the foreseeable future. You will also notice that down at the bottom of the grid, BMW’s Nick Heidfeld and McLaren’s defending champion Lewis Hamilton share Vettel’s hexakosioihexekontahexaphilic heft. It only goes to show that a pact with the devil is never as simple as is looks.